Two New Yorkers taking in the madness of the subway. Every morning, millions of people across the world crawl from their homes and make agonizing journeys underground through the dark, dank portals we commonly refer to as subway systems. In exchange for money and pieces of our souls, these portals get us where we need to go—and, unfortunately, the prices we pay for those journeys climb ever higher and higher. While they’re not all hopping the train, the heroes of this week’s best new comics are all journeying toward different things, including freedom, knowledge, and power. A bunch of kids partying and getting possessed by aliens. There are many excellent reasons why teenagers shouldn’t drink, but that’s never stopped them from pilfering bottles from their parents’ liquor cabinets and sneaking off to get sloshed with their friends. In most cases, this usually leads to brief windows of inebriated fun and regrettable decisions followed by copious amounts of vomiting. But in Image Comics’ Burnouts, from writer Dennis Culver and artists Geoffo and Lauren Perry, booze is a gateway drug to the truths that sober people can’t see. Andy, the hero of Burnouts, is a Good Kid™ who gets solid grades and would never dream of disobeying his strict but loving parents. But Andy also can’t deny the fact that he still longs to be a regular teen and hit up the occasional party with his friends—something his parents would never condone. Of course, Andy eventually makes his way to a party where, yes, there’s a bit of drinking and pot smoking, and while the experience doesn’t immediately turn him into a hopeless degenerate, it does change his life forever. Number and Buddy disembarking the Non-Local Express. 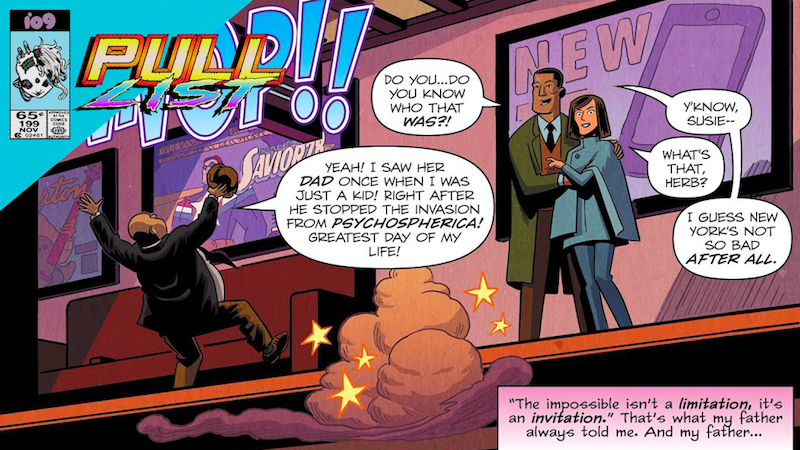 IDW’s Impossible Incorporated, from writer J. M. DeMatteis and artist Mike Cavallaro, exists somewhere between the Fantastic Four and Galaxy Express 999. The improbably-named Number Horowitz is a young genius who, like all children of missing super scientists, longs to be reunited with her long-lost father, who disappeared while testing an experimental method of interdimensional travel. Fifteen minutes after Dr. Goliath Horowitz boarded the Non-Local Express, the train-like vehicle returned to its origin point, but Horowitz himself was nowhere to be found. Two years later, Number and her ragtag family of fellow geniuses have figure out how to pilot the Non-Local Express along the Infinite Spiral, the nexus of all things that acts as a kind of railway between various realities, but still have no clue about where Goliath might be or what happened to him. The tale of Moth & Whisper. Set in a stylish dystopia where corporations more or less control the lifestyles of their employees and the concepts of personal spaces and privacy are considered antiquated, Aftershock Comics’ Moth & Whisper, from writer Ted Anderson and artist Jen Hickman, tells the story of the greatest thieves of all time. Though they were once criminal rivals, the original Moth and Whisper ended up falling in love—and in time, welcomed a child into the world who inherited both their parents’ impressive thieving skills. Together, Moth and Whisper raised their child and imbued them with all their knowledge, until one day the mysterious pair suddenly vanished. But rather than giving other thieves a chance to fill the vacuum left in their parents’ wake, Moth and Whisper’s child steps up to the plate to take over the family business by becoming both the new Moth and the new Whisper, effortlessly fooling everyone in the process. Olivia Twist standing up for Pip. What Dark Horse’s Olivia Twist lacks in faithfulness to Charles Dickens’ Oliver Twist, it more than make up for with its timely story about a future in which xenophobia and capitalism have plunged the world into a series of devastating conflicts. Writers Darin Strauss and Adam Dalva and artist Emma Vieceli reimagine Dickens’ Twist as a kind of parable about importance of valuing one’s self in a world where a premium is placed on the ability to do labor and generate profit for massive corporations. Like all orphans born into the new world’s underclass of people deemed “unsafe,” Olivia toils away in an internment camp for children, waiting for her 18th birthday when she, in theory, is meant to become free.